The Glycemic Index (GI) is a way to evaluate the effects of carbohydrate-containing foods on your blood glucose level. 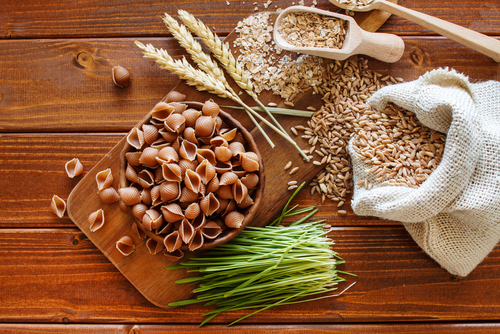 Carbohydrates with a GI value of 55 or less are more slowly digested, absorbed and metabolized and cause a lower or slower rise in blood glucose. Many flour-based foods such as bread have a high GI value in the range of 70-75. The GI value of pasta ranges between 43 and 61, with values for most types in the mid-50s. This is because pasta’s starch structure causes it to be digested more slowly than the same amount of flour made into bread. The extrusion process used in shaping pasta makes the dough dense and less accessible to digestive enzymes. The way in which pasta is cooked also affects the glycemic index. Cooked al dente, pasta’s GI index is lower than when it’s overcooked. The cooking water should remain clear and the pasta should be not sticky when you drain it. Cloudy cooking water indicates that starch is leeching out of the pasta, which raises the GI. There is a lot of variability in pasta’s GI value because of the many forms and shapes it can take. However, whenever possible, cook with whole-grain versions of pasta which retain more of the fiber, vitamins and minerals of the original grain kernel.